This memorial window was unveiled at St. Clements to be a war memorial in 1917. 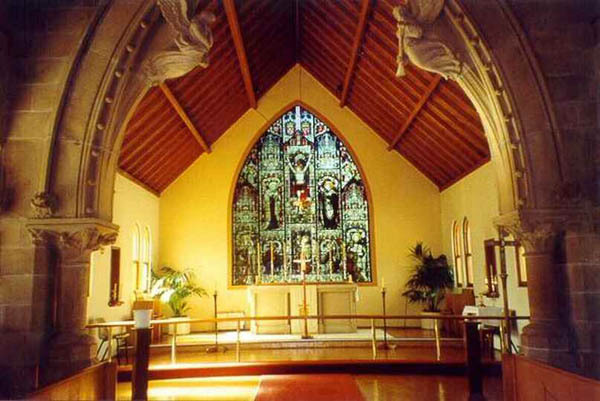 After demolishion in 1963 the window was exported to All Saints church, Ainslie, Canberra, Australia. All Saints rededicated it as their WW2 memorial. Designed by the Kemp Studio. ‘The War Memorial to 154 men who fell in the Great War consists of an extremely beautiful stained ‘Kempe’ window at the east end, erected at a cost of £600. The main subject is the Great Sacrifice on the Cross. In the central light is represented the Crucifixion; on the two adjacent lights are the figures of S. Mary and S. John. In other lights are S. Clement, the Patron Saint of the Church, with his emblem, an anchor; ans S. Peter with the emblematic keys and an open book with the text S. Matthew xvi, 16, ‘Thou art the Christ, ‘ &c. In other parts are smaller figures representing S. Michael and the Dragon, David, Isaiah, Zachariah, and Daniel, each with a scroll on which is a text referring to the Great Sacrifice. There are also subordinate figures of the Prophets Joel, Micah, Amos, Jeremiah, Ezekiel, and Malachi.